Just this past weekend, I was at my godson’s birthday party. I wasn’t planning on doing any work-related activities, but low and behold, calls were coming in, and I found myself totally missing the experience of the party, and instead, acting just like I tell my clients not to: a workaholic. 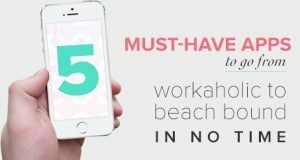 I know many of you feel the same way, and while sometimes, missing an event is unavoidable, I came up with the 5 must have apps to make your life a little easier. I share documents with my team all the time, and having Google Drive on my phone enables me to quickly check in on something without being strapped to my laptop or tablet. I can also send a quick email or text all in the same device, so it limits my time spent on any given task. I can be 3,000 miles away at the beach, soaking in the sun, and still check in on a file or proofread a document, while watching the waves crash in front of me. No plugs, no flash drives, no worries! This client relationship management app is key. I can easily add in a new contact I met on vacation, and even schedule a follow up email to go out when I know they will be back in the office. Email templates, article sharing, tracking tools – all in the palm of your hand. I can track hours, snap a photo of a client dinner receipt for my files, and even send or view an invoice right from my phone. No paperwork, no hassle. I don’t have to worry if I sent an invoice off before I left; because I can do it from anywhere. And if I do take a call or work on a task while on vacation, I can easily track the time so I don’t forget to log it when I get home. With this task scheduling app, I can easily check on latest activity to see what my team has been up to, check messages for multiple projects, look at upcoming milestones, and so much more. No more legal pads full of things to do. Every task electronically outlined with deadlines and messages. These are fantastic. With Buffer and Hootsuite, I can manage multiple social networks and pre-schedule posts, so even when I’m toes deep in the sand, my business messages are still getting out there. What are your some of your favorite time-saving apps? Please tell me in the comments on the blog. I will make a giant list of apps from all of your comments and share on my social networks. Be sure to include your name, business, and link to your website so I can promote you! These apps will surely make your life easier, but if you need further assistance, we are here for you. From finding a virtual or in-house team, to training you on new automation software, we can help. Visit www.sonayawilliams.com to get started with our FREE Support Now program or email me directly at team@sonayawilliams.com. Previous articleCan A Failed Business Rise From The Ashes? Next articleNot Happy? Live Your Own Life!